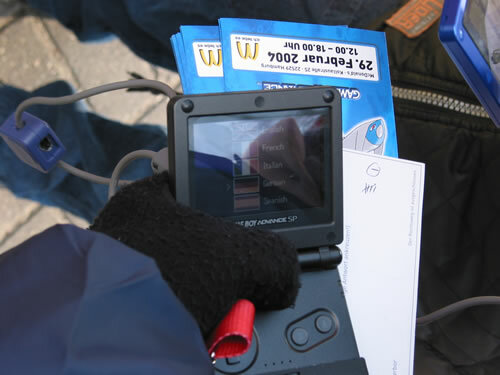 This is the distribution cartridge used for the Aura Mew event distribution in the United Kingdom, then later other European counties. In the United Kingdom the Aura Mew was distributed at participating Toys "R" Us stores as part of the Pokémon Summer Day Camp event. The overall distribution period was from August 2 to 26, 2007. This was the last Generation 3 Pokemon distribution. For a Generation 3 distribution this was quite late on as Pokemon Diamond and Pearl had already been released in all regions with the exception of Korea by this point, marking the start of Pokemon Generation 4 in most regions. So what do we have here? Well this is a rom dump of the Aura Mew event distribution used in the United Kingdom. You can use this to distribute yourself your own legitimate Aura Mew exactly as if you had attended one of the Aura Mew distributions 10 years ago back in 2007. This release was made possible with significant financial contributions from the following people: Deoxyz, HaxAras, InsaneNutter, Invader Tak, Joska, Shank, theskipster, theSlayer, WALD0 and YoshiMoshi. You might be surprised to learn that this Aura Mew distribution cost a significant amount of money to obtain, it’s thanks to the above contributors this has been preserved and yourself and future generations are able to enjoy this at no cost, the way it should be. Everything that made this release possible has taken around a year’s worth of planning to come together. Thanks to a collector who wishes to remain anonymous we are pleased to be able to release the French, German, Italian and Spanish regional variants of the Aura Mew Distribution, meaning the complete sets of these European distributions are finally available for all to enjoy. These were released on 23/12/18 and this post was updated to reflect that. The Aura Mew can be distributed on both emulators and real hardware. 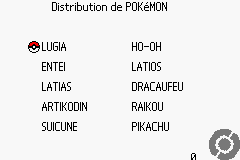 1x Pokemon Ruby, Sapphire, Emerald, LeafGreen, FireRed cart which matches the language of the distribution you are using. Turn on the GBA with your Pokemon game in which will receive the Aura Mew, holding Start and Select to enter Multiboot mode. After a couple seconds you’ll see a coloured Nintendo logo appearing on the GBA which is going to recicve the Aura Mew. You’ll see a screen that tells you a Pokemon is being received, after this has finished the Aura Mew will be in your party. 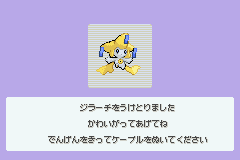 Now turn off the GBA which received the Aura Mew, turn it on again as normal and load your save game. You will find Aura Mew in your party. The backup error message has no impact on the actual distribution, it simply saves a counter which will count the total number of Aura Mew's distributed. On emulators if you see the “Backup Error” message for the distribution counter this is because unlike the 10ANNIV distribution, the Aura Mew distribution actually saves the distribution count. For the saving to work properly on an emulator ensure the save type is set to "Flash 128K" and not "Flash 64K", otherwise it will display "Backup Error”. If you are using the Everdrive before loading the rom go down to "ROM Settings" and set "Save Type" to FLASH 128K, then select "Apply". After this the distribution counter should work as intended. This has been confirmed working by @Deoxyz. gatekeeper1122, theSLAYER, theskipster and 7 others like this. Invader TAK, InsaneNutter, fabio00 and 1 other person like this. King Impoleon, InsaneNutter and Deoxyz like this. Also, for those who need help to get it working with an emulator, see my post from the 10ANNIV rom thread, which also applies for this rom, minus the tricky stuff related to the selection menu freezing. Neat, sorry I couldn't really help getting it. But now with this, and the Colosseum Bonus Disks and the Aurora Ticket distro, we have official ways of getting all four event-only legendaries for Gen. III. I guess all that's really missing is Mysticticket now. I prefer MYSTRY Mew, but Aura Mew distro is next level in terms of official-ness. VERY happy to see this available. 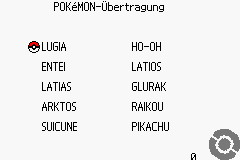 It's also nice to see this ROM will work with all the European language versions. Wasn't expecting that considering the UK 10th Anniversary distro only works with English games. I guess this is all we're gonna get for Gen 3 distros, unless a miracle happens and a US Mystic Ticket or 10th Anniversary distro pops up. But I'm not gonna hold my breath. There's a possibility of getting the other European 10ANNIV variants in the future, but I don't know if the prices will be justifiable. Especially considering how insanely hard it was to get contributions for something as sought after as Aura Mew. Not like language variants are the most interesting, nor really sought after. At least we don't have to really worry about the Aura Mew language variants, even though I'd love to compare their hex with this one. It all depends on how much interest I can get behind these roms, and of course the price. I won't fight for them with only minimal financial support like I did for Aura Mew. Not worth the trouble. As for other stuff, anything that hasn't already leaked from Nintendo isn't something I'll honestly ever expect, but nothing is impossible. Also considering we don't know what every collector may secretly have. The only other roms we know for certain exist with private collectors are the European Eon Ticket (has language select menu), UK Aurora Ticket (which supports Emerald), Negaiboshi (Wishing Star) Jirachi, PCJP 5th Anniversary Eggs, and... one other which I still probably shouldn't talk about in public, though that information is hidden somewhere around here if you look hard enough. fabio00, Invader TAK, King Impoleon and 1 other person like this. I stand corrected! Also doesn't the UK Aurora Ticket distro contain the French, Spanish, German and Italian Wonder Cards as well? I'd assume so, since I've never heard a mention of language variant roms/carts of the European Aurora Ticket, and we know such wondercards exist. It's just as hard for me to ask simple questions about these roms as it is obtaining them. So we know that someone has the UK Aurora Ticket. But is he/she willing to sell the rom? Or we don`t even know who has it? I think one of my contacts has it, but I don't remember for certain. It was last mentioned about a year ago. Other than the 10ANNIV variants, I personally would assume this to be one of the more likely roms we may be able to obtain in the future. But as of now, it hasn't been involved in any discussion of future deals, so I don't expect it to be up for sale for quite a while. Same case for that "secret" rom, but likely much longer. The Japanese roms I don't think will ever be let go from the particular source I know has them. I know that a few other people have some Japanese roms, but they were spoken of indirectly and in past-tense, so I don't know how, or if, I could contact them. At the same time they probably wouldn't want to sell anyway. As for the European Eon Ticket, I have not even the slightest idea who has it, I've just been told by a reliable source that it's out there somewhere. So what we can look towards for next year, is probably just the 10ANNIV variants. Maybe the Euro Aurora Ticket, but it's not high probability at this point. There's also someone with Gen 1 Mew Red/Blue cart that we could possibly get the savefile from, but I never contacted the person so I don't know for sure. Again, anything else all depends on how much financial support I can get. Aura Mew was hell that can't even be described. No, not the distribution cart from inside the big machines. I don't know if those still exist, but regardless I highly doubt any has ever leaked from Nintendo. I was talking about the direct trade version that used a regular Red/Blue cart sealed in a GBP and loaded full of Mews, basically just like Mystery Mew. Those people who copied the save files a long time ago really are impressive. Well the one I'm talking about isn't a copy, it's the original cart with the seal still on it, it's just cut loose from the GBP it was originally in. The part that worries me is that it likely hasn't been dumped, which means it has a chance of being totally lost as soon as that battery dies. I know someone attempted to deal with this person before, but it didn't seem to get anywhere, so I figure I'd have to make their time worthwhile with a significant payment. So it is naturally missing several Mews, but considering this is only one of the two I've seen with a private collector, it's definitely worth going after if we want to get one of these saves preserved. 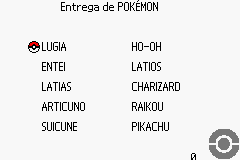 When you mencioned the Eon Ticket rom I remembered that I have a photo of the menu of the cart, don`t know if you already know this. Yeah, I've seen it. I wish it was clearer, but unfortunately, that's the only picture I've ever seen of the Eon Ticket cart. Guess I'll drop these pics too while we're on the subject. I don't have any other pics of non-public roms, except a description of the uniqueness of the "secret" rom. InsaneNutter, King Impoleon and fabio00 like this. Im happy that I was able to make a small financial contribution towards this. These carts are stupid expensive, and he has poured in thousands of his own dollars to make them available to anyone. If you are in a position to contribute the next time a new cart shows its face, please consider doing so. It all adds up and makes it possible. Thank you Deoxyz for all your contributions and work to preserve and archive these carts. The next time an opportunity comes up, let me know and Ill gladly contribute again. InsaneNutter, Invader TAK, Deoxyz and 1 other person like this. Invader TAK, InsaneNutter, Deoxyz and 1 other person like this.